Home › News › Why Are Tiles so Compatible with Tunnels? A question we get asked here at Tile Devil frequently is “why are the surfaces of so many tunnels tiled?” Although not all tunnels are tiled, it’s true that a considerable number of tunnels right across the globe - whether for railways, roadways or walkways - are adorned with tiles. In this article we’ll investigate the reasons for choosing this wondrous material as the ideal inner surface for so many tunnels. Whizzing trains and cars kick up all kinds of grit, chippings, and pebbles which smash off the inner walls of tunnels. Over a period of time, such a continuous barrage could cause extreme erosion within the tunnel. Hence an extremely durable inner protective lining is required. Tiles are exceptionally hard, durable, and chip resistant - even in the most unforgiving of environments - and hence are the ideal option to provide this protective lining. The grit and grime kicked up by the constant stream of traffic can rapidly adhere to tunnel inner walls. Fused with the soot and fumes spewed out by vehicle engines, this dirt steadily accumulates into a filthy cake which can graft itself onto the walls in a very unsightly manner. Such encrusted grime, once embedded into a surface, is notoriously difficult to clean. Unlike concrete and similar construction material, tile is extremely non-porous – meaning it’s very resistant to absorbing dirt and grime. Rather than becoming embedded into tile, dirt particles tend to accumulate on top of the tile surface, making them relatively easy to remove with high-pressure hoses and light detergents. One of the reasons tiles are used in showers and bathrooms is that they’re waterproof. This fundamental characteristic of tile is another reason for its selection as the inner lining of tunnels. As is often the case, the natural water table can lie higher than the base of the tunnel. In such circumstances, water can seep through the more porous construction material in the tunnel outer walls. The use of a tile inner lining, however, will prevent any infiltrating water from leaking into the tunnel itself, and facilitates the controlled channeling of such water out to a safe reservoir from where it can be pumped if necessary. For reasons of structural stability, and to accommodate massive boring machines, tunnels are almost always dug out in a cylindrical fashion. Creating a protective inner lining in a cylindrical shape, however, can be extremely challenging. For example, if a metal or plastic lining was opted for, sheets would need to be prefabricated that would mould exactly into the curves of the tunnel. Extra sheets would also be needed to create precise mountings around emergency exits, ledges, etc. The technological and economic demands of such an option are extremely onerous. Tiles, on the other hand, can be positioned in such a way to cover almost any shape without the need for special prefabrication. They can easily form a curved surface by gently increasing the angular position of successive lines of tiles. Although each line of tiles lies flat, the overall surface is curved. The ease with which tiles can create a curved surface, and effortlessly fit around openings and corners, is yet another characteristic which makes them the ideal material to line the inner surface of tunnels. Although incredibly durable, tiles can eventually become chipped, damaged or cracked due to relentless vibration and the constant bombardment of chippings from passing vehicles. A damaged tile can be easily and economically replaced on-site, rather than having to fabricate and install a new metal or plastic sheet. Glazed tiles, and particularly those with a glossy glaze, are incredibly reflective. The undulations and protrusions on a glossy glazed surface are limited to a length of about 390nm which is an indiscernibly minute distance. This distance is so infinitesimal that it’s actually shorter that the wavelength of visible light, and thus to light the surface appears perfectly smooth! So when light falls onto a glossy glaze it bounces off the surface in a “specular”, or mirror-like, fashion that is highly reflective. This characteristic facilitates optimally safe driving conditions within tunnels, as light from tunnel and vehicle lamps are specularly scattered off the tiles and reflected right around the tunnel, thus allowing for greater visibility. This reflective characteristic of the tilled wall also means that lighting needs are decreased thus promoting cost-effectiveness. As construction materials go, there is nothing more beautiful than tile. Consider, for example, the gorgeous tiled metro tunnel in Lisbon, shown below. 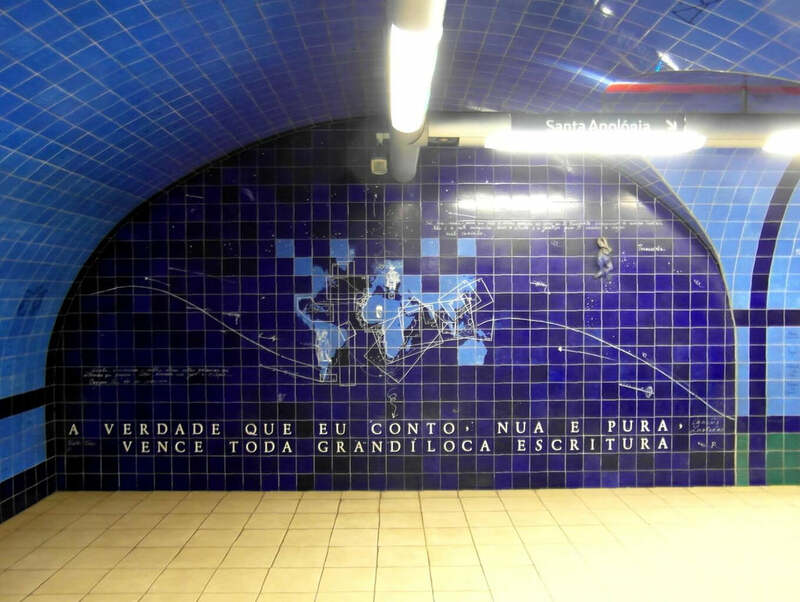 Photo: Decorative Wall Tiles in the Lisbon Metro, Portugal. Now imagine the same tunnels lined with concrete, plastic or metal! There’s just no comparison in terms of aesthetics, particularly when we consider the enormous variety of tile shapes, sizes and designs available in contrast to plain one-dimensional concrete. Tunnels are engineering feats of brilliance. And when it comes to the optimal inner surface for a tunnel, any proficient engineer will choose the material that offers the most benefits of all available options. There’s no doubt as to which material wins here. So let’s all raise a glass to the amazing tile. Not only brilliantly gorgeous, but an engineering feat in itself.